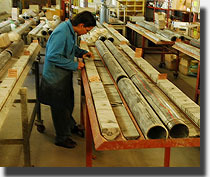 The Core Analysis Division of GEOTECH offers petrophysical testing of consolidated and unconsolidated cores at ambient conditions as well as at elevated temperatures and pressures (reservoir conditions). 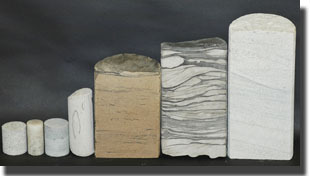 In addition to core plugs obtained from conventional core, GEOTECH has the capabilities to analyse sidewall cores and MSCT samples. The laboratory is also equipped to conduct analyses on whole core at ambient and overburden conditions. GEOTECH staff have considerable experience on the North West Shelf of Australia, having been involved in this area for over 20 years. The company is capable of handling large quantities of core and has been awarded contracts for several major North West Shelf developments, including for the longest core cut in the southern hemisphere. With an investment totalling approximately $500K, substantial method development as well as fabrication and purchasing of modern equipment, GEOTECH operates a state of the art core analysis facility. With the availability of supplementary tests (such as reservoir fluid characterisation by thermal extraction GC-MS), the strength of the associated geochemistry activity, the general laboratory infrastructure, and the quality and experience of the staff, the Core Analysis Division has a significant edge over other providers.